We just released TestFarm 2.0. Now on GitHub. In Debian/Ubuntu, if you installed python-stdeb first, it will be installed as a deb package you can remove as other debian packages. This release is a major rewrite on the server side. You can expect it more reliable, more scalable and easier to install. It is also easier to maintain. Most changes are at the server and the client-server interface. Client API is mostly the same and migration of existing clients should be quite straight forward. Regarding CLAM, it would be nice if we can get a bunch of CLAM testfarm clients. Now clients are easier to setup. In order to setup one, please, contact us. CLAM finally made its way into the official Debian repositories. Many thanks to the maintainer, Taniguchi Takaki. For the convenience of Ubuntu users, we deployed a personal package archive (PPA) in launchpad. Instructions available at the same page. It currently contains libraries, extension plugins, NetworkEditor and Chordata packages for maverick, and platforms i386 and amd64. The CLAM project is pleased to announce the first stable release of Chordata, which is released in parallel to the 1.4.0 release of the CLAM framework. 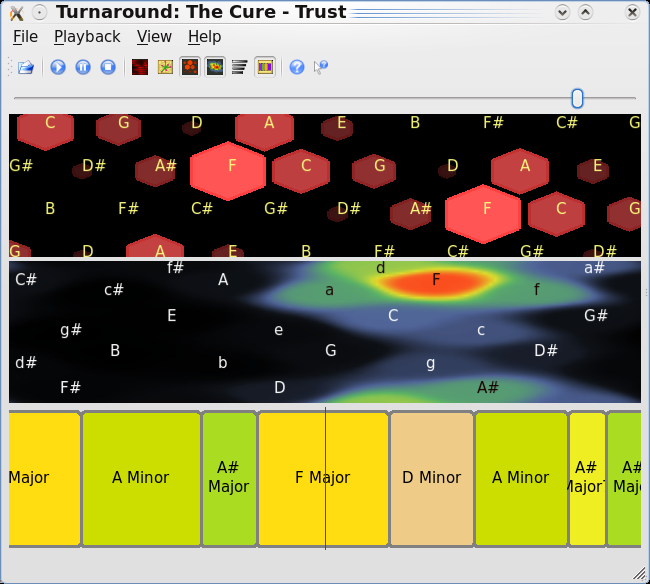 Chordata is a simple but powerful application that analyses the chords of any music file in your computer. You can use it to travel back and forward the song while watching insightful visualizations of the tonal features of the song. Key bindings and mouse interactions for song navigation are designed thinking in a musician with an instrument at hands. This application was developed by Pawel Bartkiewicz as his GSoC 2008 project, by using existing CLAM technologies under a more suited interface which is now Chordata. Please, enjoy it. The CLAM project is delighted to announce the long awaited 1.4.0 release of CLAM, the C++ framework for audio and music, code name 3D molluscs in the space. In summary, this long term release includes a lot of new spacialization modules for 3D audio; MIDI, OSC and guitar effects modules; architectural enhancements such as typed controls; nice usability features for the NetworkEditor interface; convenience tools and scripts to make CLAM experience better; enhanced building of LADSPA plugins and new support for LV2 and VST plugin building; a new easy to use application to explore songs chords called Chordata; many optimizations, bug fixing and code clean ups. Many thanks to the people who contributed to this release, including but not limited to the GSoC 2008 students and all the crew at Barcelona Media’s Audio Group. 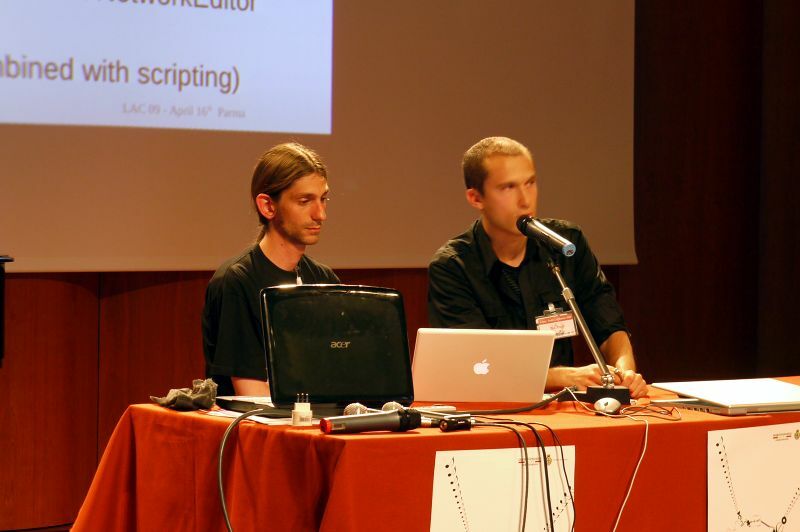 The spacialization module and helper tools, contributed by Barcelona Media audio group, turn CLAM in tandem with Blender and Ardour, into a powerful 3D audio authoring and exhibition platform. Here you can see some related Videos. Typed controls extend CLAM with the ability to use whichever C++ type as the message for a control. So, not just floats, but also bools, enums, integers, or envelopes can be sent as asynchronous controls. Examples on boolean and MIDI controls are provided. Music Annotator application now is designed to aggregate several sources of descriptors and update them after edit. Descriptors are mapped to a work description schema that can be graphically defined. Also semantic web descriptor sources to access webservices such as MusicBrainz have been implemented. You can download them from the download page. Source, windows, debian and ubuntu packages are available. Contributed binaries for other platforms are welcome. See also: development screenshots, the CHANGELOG, the version migration guide and the new CLAM group on youtube. Clam developers Pau Arumí and Natanel Olaiz recently presented some new work in the fantastic Blender conference in Amsterdam. The talk was about a technology developed at BarcelonaMedia involving an innovative usage of Blender for 3D audio using CLAM for the audible-scene rendering and decoding and Ardour for playing out to any loudspeaker-layout. It was really nice to meet Blender developers and artists, and the overall conference was fun and a great experience! Now we expect to collaborate more with the Blender project in the future. We present a use of Blender for an innovative purpose: the remastering of traditional movie soundtracks into highly-immersive 3D audio soundtracks. To that end we developed a complete workflow making use of Blender with Python extensions, Ardour (the Digital Audio Workstation) and audio plugins for 3D spatialization and room acoustics simulation. The workflow consists in two main stages: the authoring of a simplified scene and the audio rendering. The first stage is done within Blender: taking advantage of the video sequence editor playing next to a 3D view, the operator recreates the animation of sound sources mimicking the original video. He then associates the objects in the scene with existing audio tracks of an Ardour session with the soundtrack mix and, optionally, adds acoustics properties to the scene prop materials (e.g. defining how a wooden room will sound) to render acoustics simulation using ray-tracing algorithms. In the second stage, a specification of the loudspeakers positions used in the exhibition is given, and the Ardour session with the soundtrack is automatically modified incorporating all the Blender’s edited sound scene, the necessary routing, and the 3D audio decoding plugins such as Ambisonics and other techniques implemented with CLAM. The slides are available (we hope to add the accompanying videos soon). Google Summer of Code 2009 is warming up. We still don’t know whethe CLAM will be hosted again in this program. But, in any case, we really encourage you to get involved in the program. If you have doubts, we recommend you take a look at the following video. And, where to follow? Take a look at this ToDo List for GSoC 2009 and of course, read the program FAQ. CLAM has moved to a new home: clam-project.org We also changed the wiki URL scheme. code name The Shooting of the Flying Plugins release. NetworkEditor automatically generates and compiles a LADSPA plugin containing the network you are editing. CLAM also provides a new simple API to code that by hand yourself. A bunch of new 3D spatialization processings from CI Barcelona Media audio research group. Scripts and graphical front-end to generate a native CLAM plugin project from scratch. And a lot of small nice features and fixes you will appreciate for sure. Source and binary packages for different platforms are available at the CLAM download page. See also: development screenshots, the CHANGELOG, and the version migration guide.